A 28-year-old male is found down in a snowbank. He was last seen leaving a nearby bar a few hours prior. The outdoor temperature is -16°C. There is no previous medical history available. Paramedics find him to be pulseless and CPR is initiated immediately. The initial rhythm is ventricular fibrillation (VF). While en route to hospital he is given a total of 4 mg of epinephrine, 450 mg of amiodarone and received 3 defibrillations but remains in VF. EMS is unable to get a temperature peripherally. Upon arrival to hospital the patient’s pupils are 3 mm and sluggish bilaterally. There are no signs of external trauma. A STAT ABG is sent off. Capillary glucose is 10 mmol/L. How will you measure the patient’s temperature? The preferred site to measure core temperature in severely hypothermic patients is the lower third of the esophagus as this most closely approximates cardiac temperature. If this is unavailable or the patient is not intubated, a rectal or bladder probe is acceptable but is less accurate and will lag behind true cardiac temperature with rewarming. Oral temperature probes are not accurate and should be avoided in this circumstance. All measurements need to be taken with a device calibrated to read cold temperatures. The patient is intubated while CPR is ongoing. He remains in VF. An esophageal temperature probe reveals a core temperature of 19°C. How would classify this patient’s degree of hypothermia? Hypothermia can be classified into 4 stages based on clinical symptoms and core temperature (see table below). This hypothermic patient is in cardiac arrest, placing them in stage IV. Cardiac arrest is possible with a temperature below 32°C but the risk of cardiac arrest increases substantially below 28°C and proportionally with further decreases in temperature beyond this. What are your options for rewarming this patient? The management of the hypothermic patient is dictated by the stage of hypothermia. Patients in stage I are still able to generate heat by shivering and thus require only passive rewarming measures: removing cold and wet clothes, wrapping in warm blankets, providing warm sweetened fluids by mouth. Hypothermia stages II and III patients require active external rewarming (forced air rewarming, radiant heat and application of heat packs) as well as minimally invasive rewarming techniques (IV fluids warmed to 40°C). Hypothermia stage III may also require airway management based on neurological and respiratory status as well as extracorporeal membrane oxygenation (ECMO) if there are persistent ventricular arrhythmias, systolic BP< 90 mmHg, or core temperature < 28°C. Patients in hypothermia stage III should be reviewed with an ECMO centre to consider suitability for transfer. What is the preferred warming strategy for hypothermia patients in cardiac arrest? In select hypothermic patients in cardiac arrest, transfer to an ECMO center may reduce mortality by as much as 40-90% (a NNT = 2). As such, ECMO or cardiac bypass (CBP) are the preferred warming strategy for hypothermia patients in cardiac arrest, if available. Transport time to an ECMO center is 1 hour by plane. The patient has an unknown downtime and remains in VF with ongoing CPR. Capillary blood glucose is 15 mmol/L. The results of the ABG reveals that the patient is severely acidotic with a mixed respiratory and metabolic acidosis. Will you transfer the patient to ECMO center? In what situation would consider termination of resuscitation (TOR) instead? I feel that this patient met criteria to consider transport. He’s cold, but not in rigor mortis, his potassium is high, but not ridiculous and his is young. Even for eventually to be an organ donor, I would push to transfer this patient. If there are obvious signs of irreversible death or major trauma (decapitation, truncal transection) then transport would not be indicated. If the patient is frozen or rigid (ie: compressions not possible) then this should also strongly suggest termination of resuscitation. Importantly, fixed dilated pupils, areflexia, and stiffness resembling rigor mortis are not reliable in determining death in hypothermic patients. For hypothermic drowning patients, consider whether this was a submersion (patient underwater suffering hypoxic cardiac arrest before cooling) or immersion (patient immersed in water but breathing oxygen prior to cooling) event. The latter is thought to have a more favourable prognosis. In hypothermic avalanche victims, if the victim is buried in snow for over 35 minutes and the airway is patient, the arrest may be due to hypothermia and ECMO transfer should be considered. If the patient has arrested and is found within 35 minutes or the airway is packed with snow then hypoxia is more likely to have caused death and aggressive resuscitations efforts targeting hypothermia are less likely to be successful. If there is history of a witnessed arrest prior to hypothermia then transfer for ECMO may not be beneficial unless there is another compelling reason for ECMO. A serum potassium > 12 mmol/L strongly suggests death occurred before hypothermia and that the patient may not benefit from prolonged resuscitation efforts. Provided the above caveats, current recommendations are for the patient to be transported to an ECMO center if a 6-hour transport time is feasible. Given that many of these recommendations are based on case reports and expert opinion, have a low threshold to discuss the case with your regional ECMO or CBP center if there is any uncertainty. If the patient is in cardiac arrest and the core temperature is over 32°C, then hypothermia is not the cause of the patients ongoing arrest and one should consider other causes of arrest. Consider termination of resuscitation as per your usual protocols rather than transfer in this case. The patient in this case has no signs of external trauma to account for his arrest, his airway was not packed with snow, he is in VF (favourable compared to asystole), and his potassium is only 6. These are favourable prognostic indicators. Transport time is only 1 hour away. Transport for ECMO would be reasonable in this case. What if the patient is asystolic? I don’t think asystole vs VF changes things much to be honest. In the absence of an obvious lethal injury or a non-compressible chest, current guidelines still recommend giving it a go. While this would be less favourable prognostically, given the patient has other favourable prognostic indicators, this should still be discussed with the regional ECMO center. Transfer for ECMO would still be reasonable. The community physician contacts the receiving ECMO center who accepts transfer of the patient. Travel time is 1 hour. A physician and nurse will join the patient for transfer. How will you rewarm the patient while en route? Just try to prevent further heat loss: bear hugger, warm IV fluids. Forget about bladder and chest lavage as it doesn’t really work, is logistically complicated, and wastes time to definitive warming. The best rewarming strategy for the hypothermic patient in cardiac arrest during transport to ECMO is controversial. Given that we know that hypothermia is protective in cardiac arrest, there is a good argument to be made that rewarming the patient (and specifically, the patient’s brain) before adequate circulation is restored may worsen neurologic outcome. As such, it would be reasonable to only prevent further heat loss on transport using only external rewarming strategies (ie: warm blankets, forced air rewarmer) with minimally invasive internal rewarming strategies (warm IV fluids) until ECMO can allow more rapid rewarming while restoring perfusion. The “Hypothermia Burrito” is depicted below as described by Brown et al. Warm IV fluids infusing during transport is reasonable as the hypothermic patients are likely quite hypovolemic secondary to cold diuresis. Importantly, for the reasons discussed above, avoid applying heat directly to the patient’s head while in cardiac arrest. “Hypothermic Burrito”. From Brown et al. 2016. If CPR is poor and patient warms above 30°C, you kill brain. Better to keep cold with average/good CPR than warm with bad CPR. What if you were more than 6 hours away from transport and the tertiary center declined transfer? The efficacy of thoracic, peritoneal and bladder lavage is modest. Thoracic lavage is likely the most efficacious and may rewarm at a rate of 2-3°C per hour but may be difficult to perform safely during CPR. How will you provide high-quality CPR throughout transport? The patient requires a one-hour transport time. We know that the quality of CPR begins to degrade after two minutes. There will be two providers transporting the patient. It’s unlikely that high quality CPR can be delivered throughout transport. This a situation where mechanical CPR (mCPR) would be incredibly helpful if available. For hypothermia patients requiring prolonged CPR, intermittent CPR is an option. Current guidelines suggest that for patients < 28°C in whom continuous CPR is impossible due to the time of extrication from the scene or due to provider exhaustion, it is acceptable to perform CPR for 5 minute-intervals with breaks of up to 5 minutes. If the core temperature is under 20°C, breaks of up to 10 minutes are permissible. These recommendations are based on poor data gleaned from case reports and so every effort should be made to provide continuous CPR. But, if this is simply not possible, you have options. The inevitable pauses in CPR during the various phases of the transfer are another great reason for mCPR and likely the one area in the literature where mCPR has been shown to be of benefit. Any other meds you want to give during transport? Will you keep defibrillating en route? A reasonable compromise would be to give 3 shocks, 3 doses of cardiac meds then defer further interventions until core temperature is 30°C. During transport, the patient is bagged with a BVM with a PEEP valve while continuous CPR is provided, with interruptions for breaks of up to 5 minutes due to provider exhaustion. A second liter of IV ringer’s lactate is infused en route and the patient is wrapped in warm blankets. No warmth is applied to the patient’s head. No further attempts at defibrillation or doses of epinephrine or amiodarone are given. Upon arrival to the tertiary centre, the cardiovascular surgeon places two femoral sheaths and initiates the patient ECMO. The patient is eventually warmed and converted to a hemodynamically stable sinus rhythm. Unfortunately, subsequent brain imaging revealed severe hypoxic injury and the patient was eventually deemed brain dead. The family did consent to organ donation. Hypothermic patients in cardiac arrest can go on to neurologically intact survival despite prolonged CPR. When first assessing a hypothermic cardiac arrest patient, look closely for signs of life as well as signs of irreversible death. ECMO is the rewarming strategy of choice for hypothermia cardiac arrest patients and should be considered if feasible in under 6 hours. During extrication or transport of a hypothermic cardiac patient, intermittent CPR may be safe and is acceptable when continuous CPR is not possible. With regards to ACLS modifications, it is reasonable to give 3 shocks and 3 doses of cardiac meds and defer further interventions until the patient is ≥30°C. Bonnes JL, Brouwer MA, Navarese EP, et al. Manual Cardiopulmonary Resuscitation Versus CPR Including a Mechanical Chest Compression Device in Out-of-Hospital Cardiac Arrest: A Comprehensive Meta-analysis From Randomized and Observational Studies. Ann Emerg Med. 2016;67(3):349-360.e3. Brown DJ, Brugger H, Boyd J, Paal P. Accidental hypothermia. N Engl J Med. 2012;367(20):1930-8. Brown DJ and BC Accidental Hypothermia Working Group. 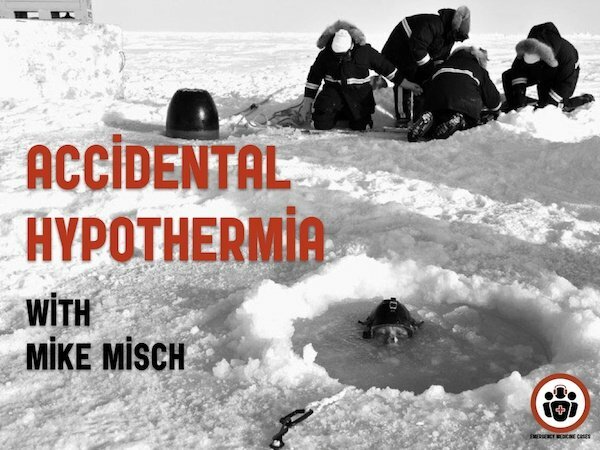 Accidental Hypothermia – Evaluation, Triage & Management. https://www2.gov.bc.ca/assets/gov/health/practitioner…/bc…/bc_hypothermia_cpg.pdf. December 9 2016. Accessed Dec 14, 2018. Gordon L, Paal P, Ellerton JA, Brugger H, Peek GJ, Zafren K. Delayed and intermittent CPR for severe accidental hypothermia. Resuscitation. 2015;90:46-9. Kieboom JK, Verkade HJ, Burgerhof JG, et al. Outcome after resuscitation beyond 30 minutes in drowned children with cardiac arrest and hypothermia: Dutch nationwide retrospective cohort study. BMJ. 2015;350:h418. Truhlář A, Deakin CD, Soar J, et al. European Resuscitation Council Guidelines for Resuscitation 2015: Section 4. Cardiac arrest in special circumstances. Resuscitation. 2015;95:148-201. Vanden hoek TL, Morrison LJ, Shuster M, et al. Part 12: cardiac arrest in special situations: 2010 American Heart Association Guidelines for Cardiopulmonary Resuscitation and Emergency Cardiovascular Care. Circulation. 2010;122(18 Suppl 3):S829-61. Cite this article as: Misch, M., Helman, A. CritCases 12 – Accidental Hypothermia and Cardiac Arrest. Emergency Medicine Cases. http://emergencymedicinecases.com/accidental-hypothermia-cardiac-arrest. Published January, 2019. Accessed [date]. Great overview. One comment on avalanches: Based on available evidence on maximum rates of cooling while buried, IKAR had the ERC now recommend only considering hypothermia as a cause of cardiac arrest if burial time is >60 min. They have also decreased the recomm6 K level that would warrant termination of resuscitation from 12 mmol/L to 8 mmol/L, although the AHA currently uses a guideline cutoff of 10 for non-avalanche related hypothermic cardiac arrest. Was under the impassion that PEEP was contraindicated during cardiac arrest as it increases intrathoracic pressure and impedes venous turn to the heart.